Whether called fate, destiny or the hand of God, slender threads are at work bringing coherence and continuity to our lives and, over time, they weave a remarkable tapestry. Explore the roles of fate and destiny, as well as rational planning, in shaping contemporary life. What are these slender threads? Being in a particular place at just the right time, meeting someone who steers us in an unforeseen direction, the unexpected appearance of work, money or inspiration? Such patterns give meaning to our experiences, and once we recognize the power of the invisible threads we can stop worrying about trying to control everything. This gives life an intensity, a sense of safety, and it helps us to experience more contentment and happiness. Ordinary human consciousness is—at the same time as being a form of awareness, sensitivity and advancement—a form of ignorance. The ordinary everyday consciousness from which we operate leaves out more than it takes in—things that are terribly important, things that, if we could know them, would go a long way toward relieving our anxieties and fears. Learn how we can expand our awareness to include those things that are left out so that we have a deepened experience of life and more access to know what is profound and mysterious in the depths of the world around us. Jerry M. Ruhl, PhD, is a psychologist, teacher, and author living in Longmont, Colorado. He maintains a psychotherapy practice in Boulder, lectures nationally, and coaches and conducts dream seminars online. 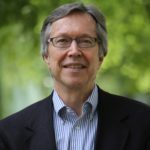 He served for six years as Executive Director of The Jung Center in Houston, and currently serves on the board of directors for Boulder Friends of Jung. Dr. Ruhl is the co-author with Robert A. Johnson of three books: Living Your Unlived Life, Contentment: A Way to True Happiness, and, Balancing Heaven and Earth. We are a 501(c)3, Non-Profit Organization designed to promote the education of the theories of Carl Gustav Jung, serving the greater Dayton, Ohio area.